bought 5 for Christmas giving...All were very pleased. good quality.. hand wash though.. would buy again ! Play the role of the perfect hostess with this cheese board set featuring a large, flat space to hold cheeses and a curved well to hold crackers. A slide-out drawer houses a stainless steel fork, spreader and two cutters for convenient access. Gorgeous board, heavy stainless steel tools. This board will last forever! 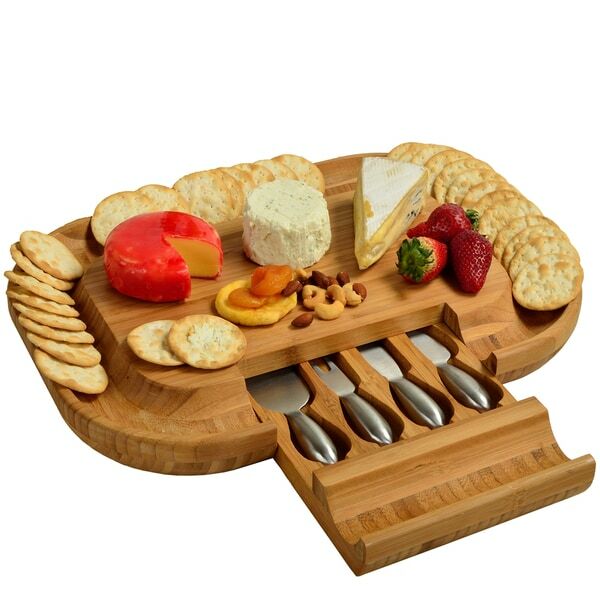 The Picnic at Ascot Deluxe Malvern Brown Bamboo Cheese Board with Stainless Steel Tool is a must have for entertaining. The tools remain sharp for many years. Beautifully made....perfect size and love the space to put the crackers! Knives are high quality. It's the perfect cheese board for company or my husband's and my wine and cheese night! Love using this cheese board when serving guests. It has plenty of space for several cheeses, and ample space for lots of crackers. The utensils are very good quality and its nice to be able to store them in the board. Highly recommend! Good quality, nice cut chesse board, all my guess love it.. Bamboo is very good and soft finish, the set of cheese cutter, it’s beautiful I bought 2 yeras agoand still nice and beautiful. Its good for wine and cheese party. I totally recommend this cheese board. I was delighted when I opened the box to find a beautiful, rich in color, and comfortably weighted Cheese Board! The design of the board includes a channel to place crackers neatly upon it! To compliment the board, a nicely integrated drawer houses four (4) wonderfully balanced utensils for cutting and serving the cheeses 🧀 of your choice! I can’t wait to start using it when I entertain! Best buy ever!!! The set is good size to hold 4 different cheese and the bonus is the knives and spreaders that come with the board. Everyone love the set when I had it out at a party. The price has gone up since my purchase but for $***, it is still worth the buy. I gave this cheese board to a relative for her birthday. She called me to say how much she loved it! Entertaining is her passion and she remarked about the weight and sturdiness. I always inspect before giving a gift and this was boxed twice so no damage. The serving knives were individually wrapped and fit perfectly in the slide out drawer. The bamboo wood is beautiful. If giving as a gift you can be confident it will be impressive. Now I want one too! Perfect for entertaining. Keeping the tools with the board is a really nice feature. Gave this as a wedding gift to my neice and she LOVED it. Assured me it was great quality. I knew it would be - everything I have purchased from Overstock has been impressive. Great product- hidden tools are an added bonus! Holds lots of goodies! I order this on February 2nd and still have not received it. It was supposed to arrive on the 8th. I called Overstock last week when the tracking information wasn't updated and they said they would send out a replacement and it didn't come due to human error. I was suppose to receive the replacement at the beginning of the week and receive a call from Overstock to verify that the replacement was sent and received. I haven't received a phone call or the replacement as it is now the end of February. I'm sure the product itself is good, but I can't receive the quality because I don't have it. I'm more bummed out because I ordered as a gift. This is the second time something like this has happened in the last 2 months. Update: Finally received it! Looked really nice. It was a gift for some friends so I haven't personally used it, but they really like it. It is a very well made and nice and heavy I may get one to give for a wedding gift! I was at the Ameristar Casino hotel in Blackhawk, CO and saw it in a magazine and decided I wanted it!! Birthday gift for my niece, liked the reviews.